Form of Praise and Thanksgiving to Almighty G-d for the Taking of Jerusalem. London: Office of the Chief Rabbi, 1917. Hebrew and English. 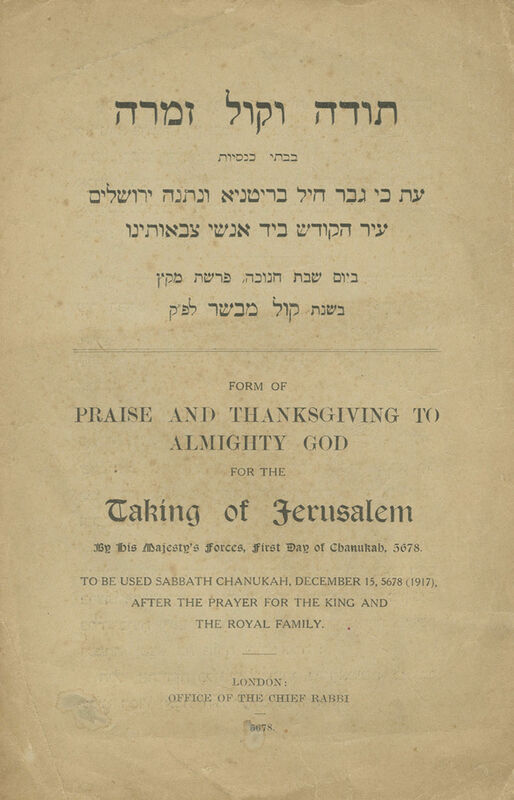 A booklet of prayers issued in honor of the capture of Jerusalem during World War I. The prayers were "to be used Sabbath Chanukah, Parashat Mi-ketz, December 15, 5678 (1917)" – four days after the city surrendered to the British army. 3,  pp, (sheet folded in half), 21.5 cm. Good-fair condition. Stains, creases and blemishes. Tears and open tears at margins and along the folding mark (mostly small).